Considering KGF's stellar run at the box office so far, the film is set to recover the entire cost of the film of about Rs 80 crore by Tuesday. Yash and Srinidhi Shetty starrer period drama KGF has done rather well at the box office despite tough competition from Shah Rukh Khan's Zero and Dhanush's Maari 2. 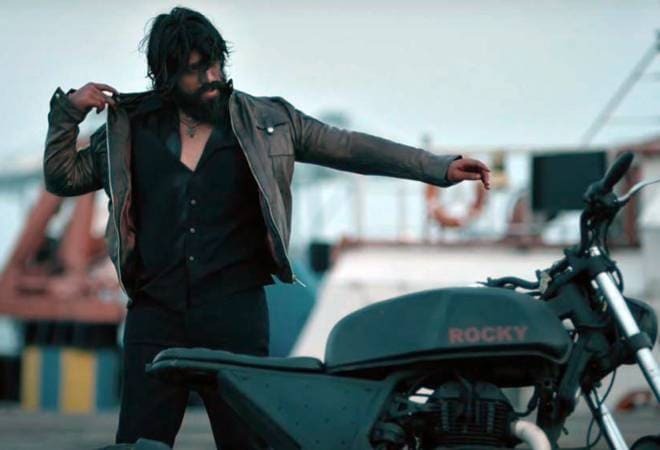 In its three-day business since its release on Friday, KGF has earned over Rs 52.2 crore at the box office. Shah Rukh's Zero, however, seems to have underperformed as per the expectations but has crossed the Rs 100-crore mark. Maari 2 has also outperformed other Tamil releases. Experts claim considering KGF's stellar run at the box office so far, the film is set to recover the entire cost of the film -- about Rs 80 crore -- by Tuesday. Apart from Kannada, the film was released in three different languages, including Hindi, Tamil and Malayalam. KGF, which stands for Kolar Gold Fields , has been a phenomenal success in Karnataka, with its overall collection exceeding Rs 38 crore in the state alone. Directed by Prashanth Neel, the film, which is the first part of the duology, is just behind SS Rajamouli's blockbuster film Baahubali in the state. KGF's gross earning across Hindi markets has also been significant. The film (Hindi version) picked up momentum in the weekend, raking in over Rs 12.10 crore by Monday. "KGF goes from strength to strength... Picks up momentum over the weekend...," film business analyst Taran Adarsh said. KGF's box office collection in Mumbai and Nizam/Andhra also stands at over Rs 3 crore. However, despite high expectations, KGF has not been able to pick up momentum across Tamil Nadu and Kerala so far. The film's collective earnings in these two states stand at Rs 2.2 crore. KGF's performance in the overseas market has also been decent. The film is said to have grossed around Rs 5 crore in the US alone. #KGF continues to trend very, very well... Mon is higher than Fri and similar to Sat... #Christmas holiday today should boost its biz further... Fri 2.10 cr, Sat 3 cr, Sun 4.10 cr, Mon 2.90 cr. Total: â‚¹ 12.10 cr. India biz. Note: HINDI version. KGF was released in 2,460 screens in the country, of which 1,500 are for Hindi version, 400 are for Kannada version, 400 are for Telugu version, 100 are for Tamil version and rest 60 are for Malayalam version of the film. KGF: Chapter 1 is a period drama set in 1970s and 1980s. The movie narrates the story of a gangster's (Rocky) rise from rags to riches. Apart from Yash and Srinishi, the cast of KGF includes Achyuth Kumar, Anant Nag, Malavika Avinash, and Vasishta N Simha in leading roles.